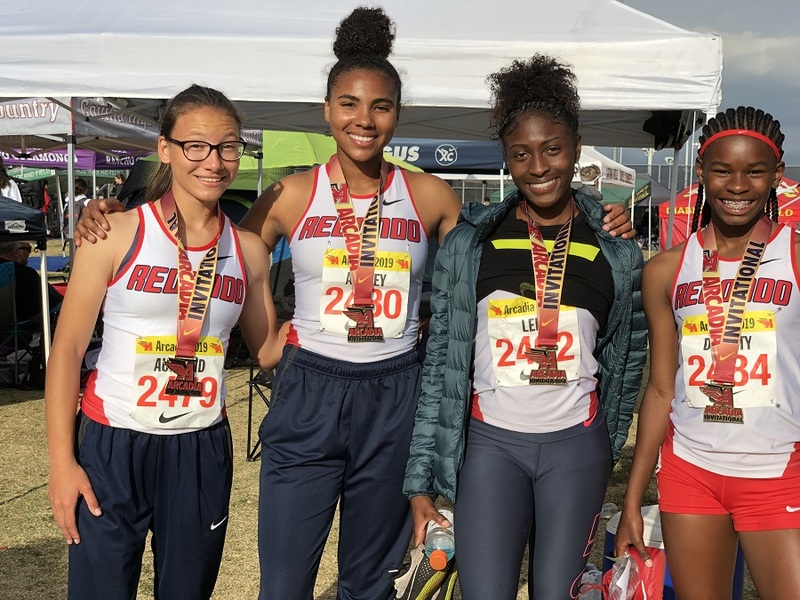 Redondo’s girls relay teams turned in impressive performances at the 52nd annual Arcadia Invitational last weekend but the highlight came when the Sea Hawk’s 4×200 relay team set a new school record. The Lady Sea Hawks had six top-10 performances but it was the 4×200 team of Julia Ausland, Amber Autrey, Eve Divinity and Mahkaia Lee who captured the title with a 1 hour, 41.28 minute performance. “It was an exciting race from finish to end, I’m glad I got to be a part of it,” stated Lee, a late substitute for Amari Turner, who placed 6th in the pole vault with a personal best of 12-7. Redondo’s girls also turned in impressive performances in the 4×100 (4th, 48.20), 4×800 (6th, 9:24.22), 800 Sprint Medley (6th, 1:51.98) and Distance Medley Relay (6th, 12:04.95). Redondo had a dual meet with visiting North on Wednesday before competing in the Mt. SAC Relays (Apr. 19-20) and Bay League finals (Apr. 26) to be held at Mira Costa. Mira Costa’s girls also fared well in the Distance Medley Relay (7th, 12:06.31) with Dalia Frias, Lucy Konamo, Lucy Atkinson and Brooke Inouye, the 4×1600 (9th, 21:13.72) and the 300 Hurdles with Amari Frasier (10th, 46.64). Mira Costa will host West Torrance in a dual meet on Tuesday. Palos Verdes placed 2nd in the 4×1600 (21:17.84) and Peninsula’s Gabrielle Pack set a personal record in the pole vault (11-01). In boys action, Mira Costa runners Billy Atkinson, Alex Fioriti, Thomas Velvin and Cy Chittenden placed 4th in the Distance Medley Relay with a time of 10:17.83. Aiden Lieb led Peninsula, winning the long jump with a personal record (22-10) and a 4th place finish in the 100 Hurdles. Palos Verdes’ Nathan Lantz finished 3rd in the 1 Mile with a personal best of 4:20.18 and was a member of the Distance Medley Relay team that placed 5th (10:18.80). West Torrance placed 10th in the Distance Medley Relay (10:29.64) and personal bests were set by Jake Parker (7th, 3200, 9:10.27) and Lyten Arthur (2nd, pole vault, 14-07).